Tusks comments come a day before Theresa May is set to visit Brussels in an attempt to renegotiate her Brexit withdrawal agreement and Irish backstop. 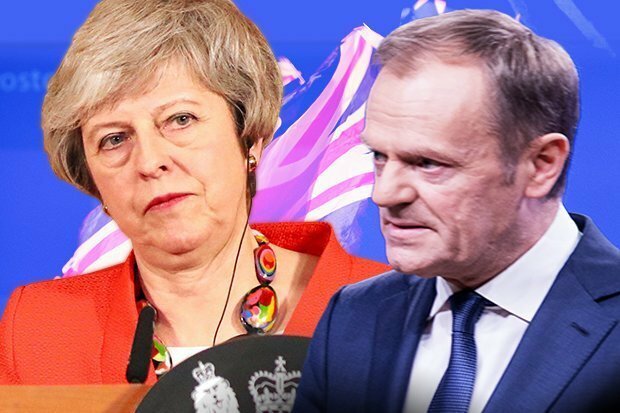 Mr Tusk said the European Union was not making "any new offer" and was hoping to hear from Mrs May "a realistic suggestion on how to end the impasse in which the process of the orderly withdrawal of the United Kingdom from the European Union has found itself following the latest votes in the House of Commons". Mr Tusk also made clear that he had lost hope that the UK's decision to leave may be reversed in a second referendum due to the "pro-Brexit stance of the UK Prime Minister and the leader of the opposition". Tusk, who will host British Prime Minister Theresa May on Thursday, was speaking after talks with Ireland's Prime Minister on how to salvage a Brexit deal before Britain drops out of the bloc in 50 days, risking the peace in Northern Ireland. John Allan, president of the CBI, said: "If the United Kingdom leaves the EU (European Union) without a deal, we could cease overnight to enjoy the benefits of tariff-free trade with, and preferential access to, markets of fundamental importance for British products and services, from Japan to Turkey". "We will not gamble with peace or put a sell-by date on reconciliation", Tusk said. As Brussels waits for Britain to set out its plans, diplomats and officials in the rest of the European Union are increasingly expecting a delay to Brexit, due to take place on 29 March. The Brexit chief for Northern Ireland's Democratic Unionist Party, Sammy Wilson, branded Tusk a "devilish, trident wielding, euro maniac". The Irish prime minister suggested that MPs either didn't know what they were doing or were misled when they voted to look for alternatives to the Irish backstop. For weeks, they have been begging May to tell them - exactly - what she wants amended in the withdrawal agreement, so that it can pass her divided House of Commons. Tusk said he hopes she will bring to Brussels "a realistic suggestion on how to end the impasse". "The EU is first and foremost a peace project", he told a Brussels press conference. While on BBC's Politics Live Jo Coburn turned to her panel guests to get a response on Donald Tusk's controversial comments. Neither will the deal's "backstop" that ensures an open Irish border, he said, denouncing the British eurosceptics now pushing for an abrupt "no deal" departure.